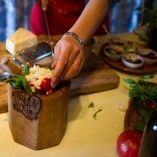 Full Meal Class | Tuscanyex | TUSCANY Experience - Excursions - Exploring - Expressions - Exclusive - Experts and so Exciting!! The Full Meal Classes are the must experience food lovers should book first while planning their holiday. Tuscany boasts an amazing number of typical recipes, food delights strictly linked to micro areas, specialized in specifi c products and cultivation. Do not expect complex recipes here. The genius of Tuscan cooking is in its simplicity. Fancy sauces aren’t needed to hide the food because Tuscans use pure, strong fl avors and the freshest of ingredients. The great dishes are in fact very basic, the most prominent cooking additives are wine and olive oil. Look at the destinations listed and located on the map here to the left. More tips and details can be found on our culinary website section, facebook page and twitter.